Sustainable Hanover, community volunteers and Longacre staff will be ready to accept your various used plastic plant pots, trays, flimsy multi-packs and plant labels on Saturday, June 20th and the third Saturday of July, August (and maybe September). No need to wash the pots, just tap free of dirt, remove staples and they will be ready for us to stack. Help us keep this usable plastic out of the waste stream and landfills. If you would like to offer an hour or two to this volunteer task, we would welcome your help. Anyone needing pots may also join us during the morning, good company and free pots are your reward! 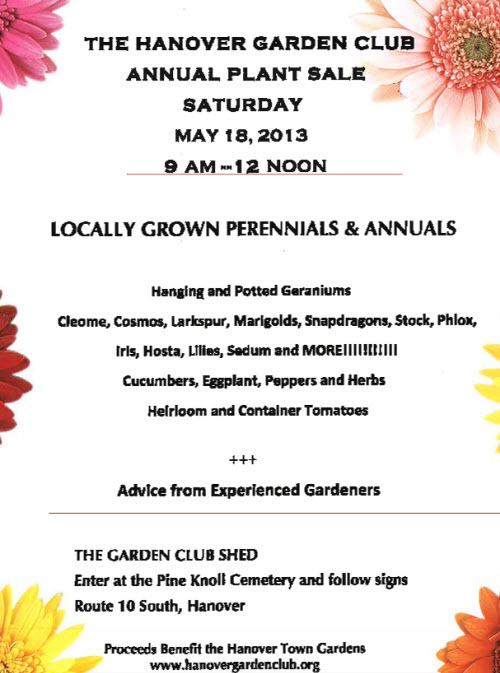 The Hanover Garden Club is holding its annual plant sale on Saturday, May 18 from 9 AM to noon at the Garden Club Shed near Pine Knoll Cemetary.